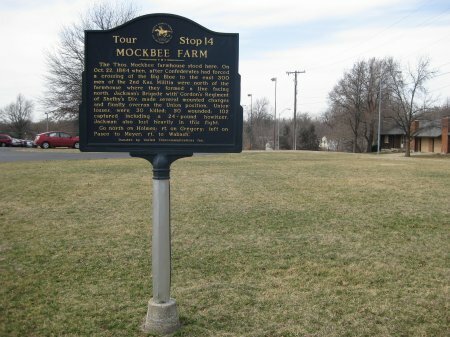 "The Thomas Mockbee Farmhouse stood here. On October 22, 1864, after the Confederates had forced a crossing of the Big Blue to the east 300 men of the 2nd Kansas Militia were north of the farmhouse where they formed a line facing north. Jackman's Brigade with Gordon's Regiment of Shelby's Division made several mounted charges and finally overran the Union position. Union losses were 30 killed; 50 wounded; 102 captured including a 24-Pound Howitzer. Jackman also lost heavily in this fight." 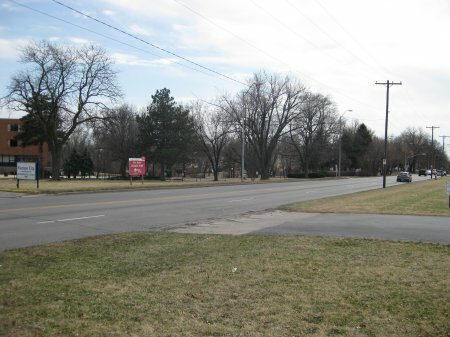 Directions to Stop #14: Tour Stop 14 is near the intersection of 78th Street and Holmes Road. Turn left (south) onto Troost Avenue as you leave Forest Hills Cemetery. After 3 or 4 blocks, turn right (west) onto Gregory Boulevard. Drive another 4 blocks until you get to Holmes Road and then take a left (south) turn onto Holmes. Continue on Holmes for about 0.9 miles until you reach 78th Street. The marker is on the southwest corner of the intersection. This tour stop is located in Kansas City, Missouri 64131. Description: You are standing where the Thomas Mockbee farm stood in 1864. There was heavy fighting that took place here both on Saturday, October 22nd and on Sunday, October 23rd. On Saturday, October 22, 1864, Union forces had established their defensive lines along the west bank of the Big Blue River. On Shelby's orders, Colonel Frank B. Gordon's 5th Missouri Confederate Cavalry had found a suitable way across the Big Blue not too far from Russell's Ford (Tour Stop 20). He crossed and found himself in between Jennison's Union troops at Byram's Ford to the north and Kansas Militia under the command of Brigadier General M. S. Grant to the south at Russell's Ford. Because of a warning message received from Union General Curtis, Grant had decided to send large reconnoitering forces out in all directions. As a result his forces were scattered when Gordon's Confederates crossed the Big Blue. Grant's men fell back to the Mockbee Farm in an attempt to meet up with Jennison's forces. This is when Gordon and Jackman attacked them. The Kansas militia offered stiff resistance. Their line broke twice but reformed. Gordon and Jackman massed for a third attack. This attack lasted only a few minutes and the Confederates broke and scattered the Kansas militia who retreated towards Westport. On Sunday, October 23, 1864, Near the Harrisonville Road (now Prospect Avenue), Marmaduke's retreating division encountered Fagan moving towards them with Slemons' and McCray's Brigades and Blocher's Arkansas Battery (2 guns). After Marmaduke's men had passed by, they opened up on the advancing Federals. This stemmed the federal advance and gave time for Jackman's Brigade to join them. Together Fagan and Jackman charged Union Brigadier General John B. Sanborn's Brigade and was able to drive them back across the Mockbee Farm. The Federals were near collapse when Union Lieutenant Colonel Frederick W. Benteen brought the Fourth Brigade to attack the Confederate flank. The Confederate attack collapsed and they turned and fled.